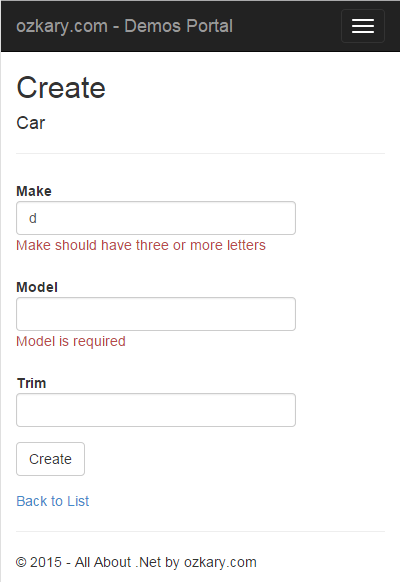 When using code generation (ORM), the model classes are automatically created by the tools. We usually try to edit the class and add annotations such as field requirements, formatting and messages. The problem with this approach is that when we need to add properties to the model class, we will need to re-generate the class and all the data annotations will be wiped out which create extra work for us. A quick way to address this challenge is to create a Metadata or Buddy class that provides all the annotations that we need. We can then add an attribute to a partial class with the same name as the class that was generated to indicate that there is another class that provides the annotations on its behalf. 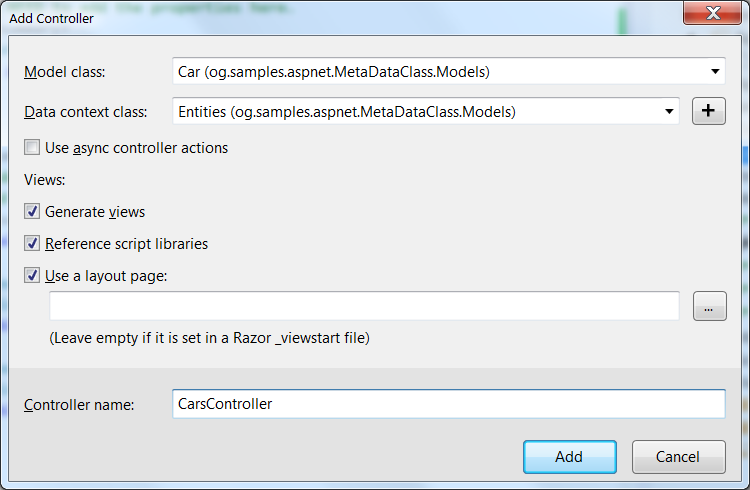 We can now take a look at an ASP.NET MVC project which can be loaded from the source code link at the end of this article. Note: This table is created using the .mdf files under the app_data folder. 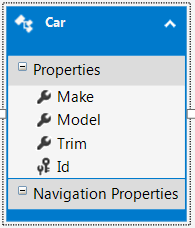 We now can use EF by adding an ADO.Net Entity Data Model to create the model from our database which generates the following definition (see Models/car.edmx file). Do not forget to compile after the table has been imported. As we can see, there are no annotations on this model. Since this is a generated class, we would like to add our annotation class instead of changing it. We need to do this before we generate the views. 2) Create another class that contains all the data annotations. b. Set the type to the class that has the annotations. /// NO NEED to add the properties here. We are making Make and Model required. In addition, we are making the Make to have a minimum of three characters. Run the application and select Run Demo under the Metadata classes section. This is how the view should look. Press Create for the validation to take place as shown below. With the above view, we can show that our data annotation validations are shown when the user does not meet the input requirements. With this approach we can show that we can still enable the use of ORM tools to generate the models and continue to support our application specific data annotation requirements without the concern of losing any information.